Posted on Friday, March 19th, 2010 at 7:00 pm. Chai Found Music Workshop is one of the foremost ensembles of Chinese Chamber Music in the world. Founded in 1991, the group is dedicated to a style of traditional music strongly rooted in improvisation. 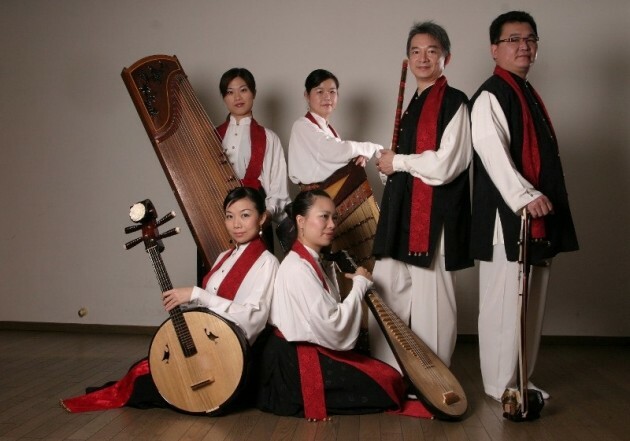 The group has performed traditional and contemporary Chinese Sizhu music in countless concerts in major venues throughout Asia, Europe and the United States. Your experience at the concert will be enhanced by the musicians’ explanation of their instruments, and the CCSA Middle School Dance Company’s performance of a Chinese Ribbon Dance. Tickets will be available at the door and are $10 for adults and $5 for students. Open Seating. Free parking. Tickets may be purchased in advance and will be held at the door. Description: Silk and Bamboo spans a broad range of musical moods, timbres, and tempos, comprising traditional pieces, modern Sizhu style compositions by Taiwanese composers, arrangements of Taiwanese folksongs, and influences from different regional styles of Sizhu music. People to People Delaware, Overseas Compatriot Affairs Commission, R.O.C.